Grandiose. Expressive. The quintessential grand piano. The Steinway & Sons Model D is the apex of Steinway magic. A true concert grand piano these 9′ instruments are as impressive visually as they are acoustically. The true ‘king of instruments’ Steinway Model D Concert Grands Pianos are the standard by which other concert pianos are judged and compared. These standard-setting instruments grace the stages of high-level concert venues across the globe. Based on the earlier concert grand from Steinway known as the Centennial Grand, the Model D was and is a culmination of Steinway piano design. Featuring a roaring, robust bass and an amazingly broad and beautiful overall tone, these instruments feature a power that reaches to the farthest corners of any concert hall. Accomplished musicians love its majestic size and spine-tingling timbre. The action is incredibly responsive and capable of providing the highest level of artistic expression. Designed to fill the space of great concert halls, these models are sometimes found in private homes. This is not common, due to their expansive dimensions and premium price point. Weighing almost 1,000 pounds, these heavy, imposing instruments feature a rim constructed of seventeen continuously bent hard rock maple laminations. This creates a rim that is incredibly strong and stable. The scale is overstrung and features both front and rear duplexes. All of Steinway’s legendary innovations have culminated in this one amazing concert level instrument. Steinway concert grands are the overwhelming choice of professional concert pianists, universities, and venues around the world. Model D grands feature an incredibly responsive action and the broad range of tone needed to compliment any repertoire. Although they many times sport a basic black, satin ebony finish, it is not uncommon to find these instruments in intriguing and eye-catching natural finishes. We have restored several very rare, Brazilian Rosewood Model D concert grands which have been sold to discerning clients around the globe. The modern Model D measures 8’11¾“ in length, and 61¼“ in width. Out of seven basic sizes of Steinway Grands, the Model D is by far the largest. Providing the highest level of percussive musical expression, these beautiful instruments are the stuff of legend. Playing a fully restored, ‘golden age’ Steinway Model D is something that cannot be fully described and for many pianists is a lifelong goal. 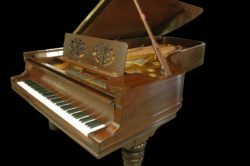 Click here to listen to a fully restored Steinway D.
We have over forty years of experience in the piano industry and have restored many concert level pianos for professional pianists, concert venues, and universities. Contact us today for an appointment and play one of these amazing pianos for yourself! We feature one of the largest selections of fully restored Steinway & Sons grand pianos in the Midwest and our facilities are open for private selection appointments. Chupp’s Piano Service, Inc. has many fully restored and original condition Steinway & Sons Model D Concert Grand Pianos currently in stock. We have one of the largest selections of fully rebuilt Model D grand pianos in the country! 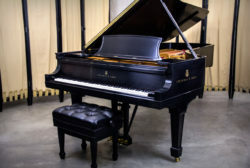 Steinway & Sons Model D Concert Grand Pianos are among the most coveted and sought-after instruments in world history. The legendary Steinway innovation and dedication to quality is carried on here at Chupp’s Pianos. Click the link below to view the pianos we have in our showrooms. Interested in a particular instrument? Get in contact with us today! Let us help you find the piano of your dreams. Error: Error validating access token: Session has expired on Thursday, 10-Jan-19 19:00:02 PST. The current time is Wednesday, 24-Apr-19 23:05:00 PDT.